What offers Ultra-HD / 4K? Why this mixup of terminologies? Ultra-HD or 4K or even 4K Ultra-HD? The current user gets confused mainly because manufacturers juggle with the names and partly, they use the same label for articles with different resolutions. Colloquial, resolutions with about 4000 pixels in the horizontal are called „4K“. More exactly it has to be distinguished between UHD and DCI resolution: UHD has 3840 x 2160 pixels like mentioned above. DCI (Digital Cinema Initiatives) is the 4K format used by digital cinemas and has a resolution of regularly 4096 x 2160 pixels. 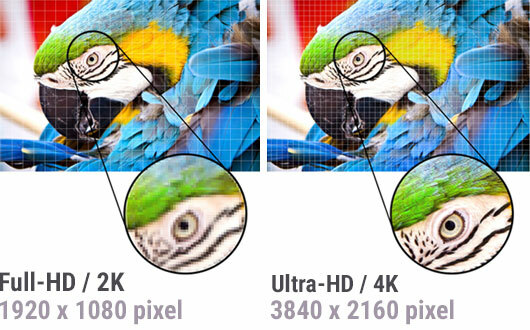 In technical view, 4K and UHD are different! However, in everyday life the name „4K Ultra-HD“ is often used. And even if the CEA already in 2012 decided the name Ultra-HD has to replace the name 4K preferred until then, there is still disagreement about the naming. Like mentioned above, mainly manufacturers mix names together for promotion proposes. The label QFHD is also used sometimes. Don't get confused! For example, a display with a resolution of 3860 x 2160 is called QFHD or 2160p/i. QFHD stands for Quad Full High Definition and the „quad“ relates to the four times higher resolution than Full HD. QFHD is just another name for Ultra-HD. . The current consumer which wants to get a new TV device, for example, has to keep in mind just the following: All symbols / letterings / logos and labels at products only point to the potential performance of the device. Images and movies can be enjoyed in the quality announced not before all components of the system are adjusted to each other, and if the source material fits, and if the data line is appropriately fast. Currently, Delock offers nearly 300 items in the product areas adapter / converter, cable and multimedia which support Ultra-HD / 4K. A great number of different adapters for diverse requirements and 4K cable in various lengths for HDMI, DisplayPort™ and USB Type-C™ are available, as well as docking stations, splitters and switches. The Delock 4K repeaters can be used for cable extension. Aktive adapters offers an active conversion and are also suitable for graphic cards that can not output DP++ signals. The only system requirement in this case is a free DisplayPort™ female. Passive adapters require a free DisplayPort™ DP++ female at the graphic card . Discover all Delock Ultra-HD / 4K products!